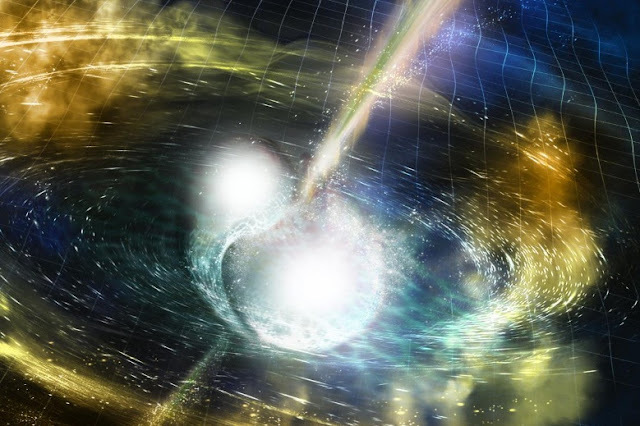 An artist’s illustration of two merging neutron stars. The rippling space-time grid represents gravitational waves that travel out from the collision, while the narrow beams show the bursts of gamma rays that are shot out just seconds after the gravitational waves. CAMBRIDGE, Mass. - Scientists in the United States and Europe have for the first time detected gravitational waves, the ripples in space and time predicted by Albert Einstein, at the same time as light from the same cosmic event, according to research published on Monday.